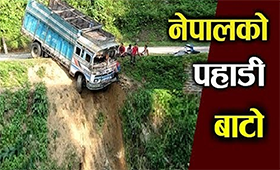 Brake Fail is Nepali Television Series produced by Media Hub Pvt. Ltd. for Nepal Television. Shivahari Paudyal is the writer of the episode and is also one of the directors. Production: Media Hub Pvt. Ltd. Production Advisor: Som Dhital Directors: Shivahari Paudyal, Kiran KC Assistant Director: Niraj Nepal Editor: Rabin Bhatta Writer / Title Song: Shivahari Paudyal Title Singer: Rajesh Payal Rai Music: Tika Bhandari Unit Management: Homnath Timilsina Camera: Manaraj Gurjudhara, Dilip Bista Make Up: Yadav Thapa Lighting: Bijaya Urab , Dipak Rayamajhi Graphics: Rajendra Manandhar, Rabindra Khadka Legal Advisor: Jyotiram Phuyal Exclusive content copyright: RamSar Media Pvt. Ltd. Artists: Shivahari Paudyal, Kiran KC, Rajaram Paudyal, Manoj Acharya, Hima Koirala, Sabita Gurung, Shivahari Acharya, Sudip Baskota, Surendra KC, Binod KC,Pawan Khatiwoda and more. Brake Fail is Nepali Television Series produced by Media Hub Pvt. Ltd. for Nepal Television. Shivahari Paudyal is the writer of the episode and is also one of the directors. The story is based on comedy entertainment theme. This serial represents lower middle class family trying to survive in Kathmandu city. Shivahari represents a husband without a job and trying to get help from others. Kiran Kc is a landlord and makes his living from rent. Rajaram Paudyal is a political leader. Manoj Acharya has played as a strong police officer.